Amidst so many Gamescom titles that seemed to tread familiar ground, Ubisoft's From Dust stood out with its impressive technology and wholly non-violent gameplay. We had a chance to speak with creative director Eric Chahi (who you may know as the creator of Out of This World) and producer Guillaume Bunier about their unique project. Read our interview past the break. Joystiq: Our first question is for Eric: What have you been doing all this time? Why has it taken you so long to make another big game [Since 1998's Heart of Darkness, by our reckoning]? Chahi: Because I had many ideas that accumulated and I wanted to make them real, so I decided to create a new game. Since maybe 2004 I knew I wanted to do something, but it takes some time to let the idea to mature. From Dust really took root in 2006. [I wasn't working] full time since then, but after I presented it to Ubisoft, it took a while to form a team, etc. Was it hard to get Ubisoft interested in a game that's so original, so different? Bunier: There was enthusiasm, but it's a big corporation, so it takes time to have the right meeting, the right people ... it's still a challenge today. For Ubisoft to carry this kind of project ... we are not used to these kinds of projects. So if the question is, "Is it difficult," yes. Is it impossible? No. It's not impossible because we are here. It shows that even if it's an ambitious, new, creative, risky [game], whatever you want, it's cool that Ubisoft can still support this project. Chahi: They are very good at supporting us even if it's difficult. Was there ever a time when someone at Ubisoft said "you should change this, this is too weird, too strange, players won't understand," etc.? Bunier: This is happening at all levels within the team. You say, "Aw, this is never going to work," and also outside the team, everybody is talking. What is important is to keep Eric's vision intact, and to make it evolve of course but always respecting what we think the game could be. And you think that vision has remained intact? Chahi: Yeah. In fact, there are several visions. I have a vision, but it's a direction of where we should go. There are some [features] that I really want because I want to have a really good balance with some element, but sometimes when a new element comes, I change part of what I was planning. The game and the way it's malleable is a perfect metaphor for game development. It's not possible, I think, for a creative director to be totally rigid because it's about all of the people that are on the team that incorporate the vision, it becomes their vision, it must come from within. People on the team must embrace the vision and be able to create from it, to take part in the integration. Sometimes when I see, "OK, I believe in this, but I know that it doesn't work," ... I know that the team will catch it and make my idea OK. ... Sometimes it can be a pain because it's difficult to provide balance, but it's important to not be rigid. JS: Was Ubisoft the first company you went to with this game? Did you try to sell it to other companies? Chahi: No, I saw only Ubisoft. Most other people would probably see lots of companies [but I was lucky]. I have a good feeling to work with Ubisoft. It's a question of intuition; I think it was the right company, they are the right size and have the money and the competencies and, the last point but not the least, it's a French company. This helps, for me. Do you feel the reputation you built from your older games helped you in selling this game? Chahi: Definitely. I think if I did not do [Out of This World], I would have gone to Ubisoft and I would say, "Yeah, this is From Dust ... it's a world there are no guns at the center of the game," [and they would not be interested.] Yes, because it's a question of trust, I think. What does the title mean: From Dust? Chahi: We talked about erosion, we talked about some things from the past, memory that has been lost. From Dust is a kind of evocation of things that go, that don't stay a long time and can crumble. Life is like that, it's short. It's a game about the brevity of mankind, too. There is a good resonance. That sounds more like "To Dust" than "From Dust" to us. Bunier: Yeah, I agree. [The title] also talks about a place and a time, and we don't want to set [the game] somewhere or some time. It's just another universe, another place. So something people create "from dust." This type of game would usually seem more suited to a PC audience. Why did you feel the Xbox 360 and PS3 would also be good places for this game? Bunier: The gameplay is fine for these types of console [download services] – an original game, very different from the classic FPS games. Flower is a totally different game, so it's a good place for Dust. They're powerful machines, and we need a powerful machine to have this simulation running. We don't want consoles to become only the land of adventure, action-adventure and first-person shooters. I personally play on Xbox 360 and PS3 more than on the PC and I'm asking for this kind of variety, as far as games are concerned. It's a bit selfish. We noticed that on Xbox Live Arcade and PlayStation Network, we've got these kind of different titles, different genres that are proposed to players. So I think that on these specific platforms, for these specific players, some innovation is going to be welcome. Do you feel that the game isn't as well suited for a disc release in stores? Why stick to digital distribution only? Bunier: It's less expensive to make, so we can have some more risky design choices, because they're not putting however many millions on the table just to get to the level of Mass Effect 2, etc. Are you worried that some people won't get to experience the game because they might not have access to downloadable games? Bunier: Of course some people will not be able to play it, and that's too bad for sure, but I think most people that we want to talk to are on these platforms, and you know, if the game is a huge success, we could always do another [disc-based] version, for sure. And also it helps us propose an experience that's only single player, at first, and then if it works to add a multiplayer aspect or an editor, etc. So it's more flexible for us, it's less expensive for Ubisoft to fund, so they said "OK, yes, we'll take a bet on this." During the demo, you showed disasters attacking these villagers. Is that the only type of gameplay, or are there other things you can do? Chahi: You can play with your environment to make a place that is suitable for a village for the humans, with, for example, the presence of a certain type of species. Bunier: You have the tower defense aspect. I am defending my bases, which are my villages, against the elements. Then you have the god game aspect, where I manipulate and get new powers in return for me helping the villages. 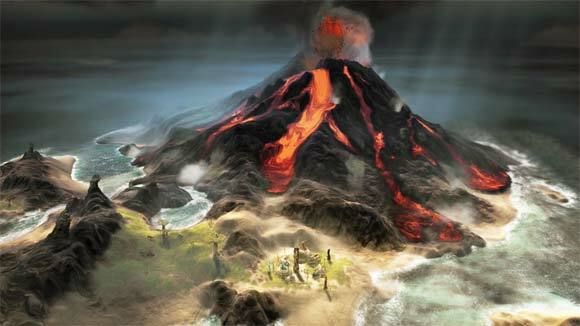 There is also an adventure aspect, because you have a full world to explore and new islands to find, etc. And then last you have a small RPG aspect, because you can choose, if one village is giving you water-related powers, you can choose to continue to continue to take care of them to the detriment of the next one. So you can build your villages around the water aspect. There is also a sort of network of villages ... This is not about preventing disasters, this is about clearing the ways of communication between the villages. For example, if I have a village that finds a water power, once they have it they will transfer it by a path to the next village. If there is a guy stuck [on the way to deliver a power], he will say 'Hey, I'm stuck, please come and help me.' So your goal is again to play with your powers to make sure that the way is clear so they can have this network of villages. Does the tower defense aspect ever get more complicated than using one power to prevent one type of disaster? Bunier: It can be a little more complex, where we can have a switch between different types of events, so instead of only a tsunami, but you'll see the different events coming. The way you saw the timeline was very straightforward, but it can be more complex. Would you say there's an environmental message to this game? Chahi: There is no ecological message ... not in the cheesy sense, at least. It's a more philosophical point of view of the nature of the universe, on how there are no good or bad things ... it all depends on the context. It's a game about the place of humans in the world and the perception of time, and it gives another perspective. We change the reality in this game, because processes are going faster, and you can see change that would maybe take 100 years or more and it becomes visible to the player. Maybe we could have another life on the Earth to see all these creations happening in real time. Bunier: Correct me if I'm wrong Eric, but maybe the main message is that nature isn't good or bad, it just is, so deal with it. That is what we are doing here, in the game. We don't say that a tsunami is good or bad, we say it's a tsunami. It can be bad if you have a village that isn't protected. It can be good if there is a huge wildfire and it will extinguish everything. It's all a question of adaptation to a changing environment.